Wacken - "Wacken Roll - Das Größte Heavy Metal Festival Der Welt"
Right on time for the 20th anniversary of the Wacken Open Air we are happy to present a joyful event to you: “Wacken Roll – The biggest Heavy Metal festival in the world”, a book by Andreas Schöwe! The book (ISBN 978-3-85445-304-8, Hannibal Verlag, 224 pages, with more than 100 pictures) is available for 14,95 Euros from now on at Metaltix. Loud, but peaceful: Every summer the biggest Heavy Metal festival in the world takes place in the small village called Wacken in northern Germany. At that time two worlds collide, which couldn’t be more different: On the one hand a contemplative, peaceful village. On the other hand a Heavy-Metal fan-community from all around the world, which meets right there in order to celebrate an extreme loud but constantly peaceful festival for a few days and to listen to the sonic thunderstorms of the hottest Metal-bands. 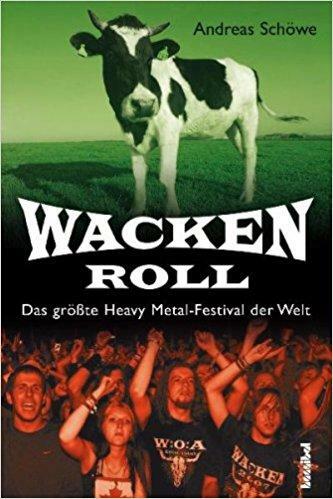 In that book the author portrays this event from all perspectives and collects a lot of funny, partly bizarre stories around the Wacken Open Air. In numerous interviews the organizers, the inhabitants, the police, the fire fighters, the regulatory agency, the mayor and on top of that a lot of musicians like the Scorpions, Doro, U.D.O., Iron Maiden, Stratovarius, Stephan Weidner or Exodus are getting a word..., - and above all the fans too. Andreas Schöwe writes for the METAL HAMMER magazine since 1990 and since two decades he passes for one of the most well-known journalists in that genre. As an insider of the Rock scene he already portrayed stars like Metallica, Guns N’Roses, Aerosmith, Deep Purple, Black Sabbath, Mötley Crüe, AC/DC or the Scorpions. The book “All Access/All Excess – Rock Stars unzensiert“ (2006)” was his last release, currently he also writes for the “Rock It!” magazine.